I enjoy an attractive script typeface now and then, so I've made a little printable featuring Wisdom Script. 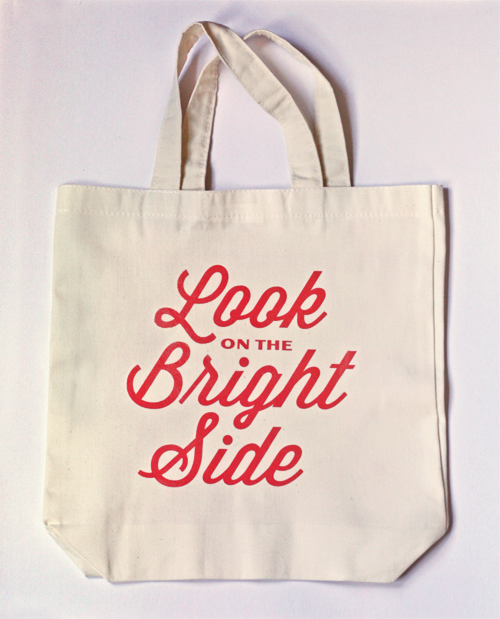 You can download the "Look on the Bright Side" graphic below and iron it onto T-shirts, pillows, or totes. 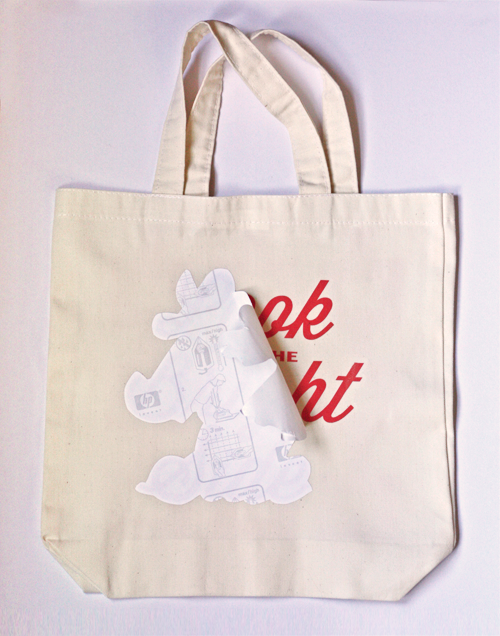 To make this tote bag, download the mirror-image design here. It's flipped so that the design will read correctly on the finished fabric. Print the backwards PDF onto iron-on transfer paper. (I used HP Iron-on Transfers for light-colored fabrics.) Trim around the graphic leaving about 3/8" border around the lettering. Place the design face down onto fabric and iron over it slowly using the cotton setting, no steam, for a minute or two. Let the design cool, peel off the backing, and you're all done. Designs will be machine washable after 24 hours. When laundering, turn the fabric inside out and use cold water. I know, I know! This type absolutely ought to be orange, but from experience I've learned that my inkjet printer has a grudge against orange. Very sad. Prints turn out muddy instead of vibrant, so I settled for red. To change the color, open the PDF in Adobe Illustrator, select the shapes, and choose a new color. If you'd like to download the normal, un-flipped design, click here. Cool! I totally love the design and the simplicity. Thanks for such a fun project. I love the message and the font with which you share it. How cute! Thanks so much for creating this for us! I love your design! And such a fun project!! Awesome, I totally love it. I recently did an iron-on transfer to a shirt for the first time--and discovered a little too late that I should have cut off as much of the white around the graphic as I could--like you did. You're smart. And I now have the Monty Python song "always look on the bright side of life" in my head. About printing orange...I illustrate books , working in the US, for a French publisher, printed in China. I learned the hard way how to make the printer work. Orange is difficult , you have to make sure there is absolutely no blue or black whatsoever in it, then take a close look at a printed sample of yellow, and add just the right amount of magenta. You also have to look at the color way in Photoshop AND your printer...and work in CMJK to avoid too much translation. I hope this will help, I find really too sad that your printer doesn't allow you orange! Thanks Jessica for the reverse design - I will put it on a t-shirt. Awesome blog, love all links to cool downloads. Thank you so much for providing this in reverse image. I miss out on lots of projects I'd like to do because for the life of me I cant get either of my 2 printers to print in reverse/mirror image. Now I can do this project!!! Lovely design, even if it is red. Good use of typography and I love the font. Love this!! I'm so addicted to Wisdom Script, I have to force myself to use other scripty fonts. :) I've been wanting to do my own tote bag, thanks for the inspiration! Thank you so much - I am going out tomorrow to buy some transfer paper to try this cool project. looks great! - i'm curious though, because from the photo it looks like you've been able to print *just* the red letters; there doesn't appear to be any of the "transparent" bits of transfer showing, ie. at the edges or the bits between the letters - usually you can see where the "clear" transfer bits are on the garment, but on your pics there appears to be none - only plump, juicy red letters. is it just good photography? :) cheers! I know exactly what you're referring to, Ben. On t-shirts I've made, that transparent film shows up more. But for some mysterious reason, maybe due to the off-white color and slightly rough texture of the canvas bag, those transparent film parts don't show up unless you hold the bag in just the right light at just the right angle. Then you can see a tiny bit of sheen where the film is. But I was really pleased how "invisible" it turned out. It looks like a screen print. Not sure why it worked so well! Great and fun project, love the font!! I wish I had seen this earlier! I used to make fabric handbags when I was living in venezuela!!!... I'll post some pics of them for memory's sake... Thanks for all the sharings! What do you suggest for the fabric of the bag? 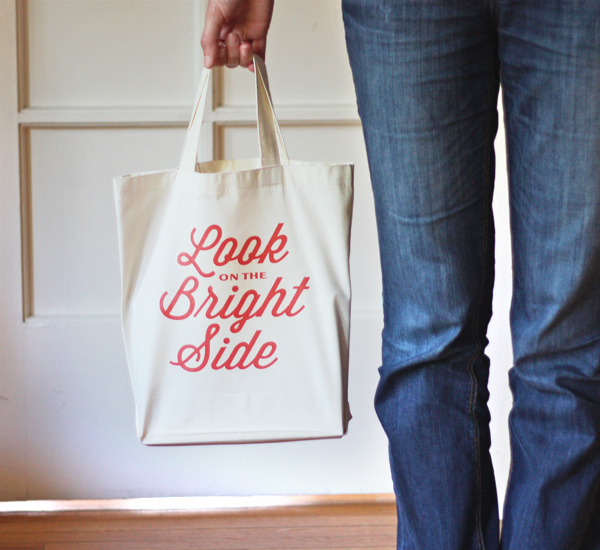 Your tote looks very soft, not like the rough canvas tote bags I see in craft stores. Was yours a blend of cotton, or 100%? Also, do you have any clue if the HP paper will work on an industrial Color copier at a Staples? As for the iron-on paper, some copy centers will print out a single sheet for you so you don't have to buy a whole box; they can tell you which one will work with their printers. Those are probably color laser printers, so look for laser-compatible paper instead of inkjet. The folks at the copy center can tell you which you'd need, though.